Since I am self-employed and I am trying to sell my services I appreciate more every feedback or recommendation that I receive, with this article I want to encourage you to give feedback when something or someone is important for you and to think about others feedback. What would you do after a long period sailing with your family? In our case, life will never be the same as before. We know what we want ; our priorities have changed and are clear. We have spent a long period of time in permanent connection with the sea, and we want to protect it. And we want to be back on the blue as soon as possible. Did I ever talk about positive discipline? I made it, I am becoming a positive discipline facilitator, I have already started practising and I am really enjoying it. I found a super partner and in November we are going to start practising online together. We use to hear/read about sailing from Mediterranean sea to the Canary Islands but we can hardly find any information about sailing from the Canary Islands to Mediterranean sea. 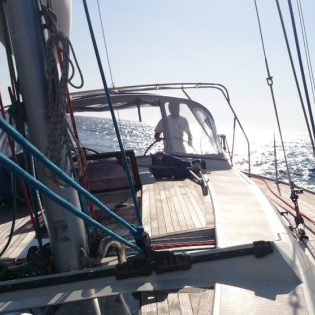 Sailing back to the Mediterranean sea from Canary Islands is going against the trade winds (Alisios), which is more difficult than going with the trade winds that is what most of the people are doing when going to the Caribean, but it is not impossible. 3 weeks ago, I gave my first conference about Agile4Life. What an opportunity to inspire others sharing our journey! I really enjoy sharing some of my passions: family, agility and sailing. From Puerto Sherry (Spain), we went to Portimão (Portugal). Our goal was to ensure that the boat was working well after all work that had been done - especially on the steering gear, before going to the Canaries Islands. Everything worked good and after some hopefully final tuning in Portimão, we would leave Europe behind and reach Rabat in Morocco.